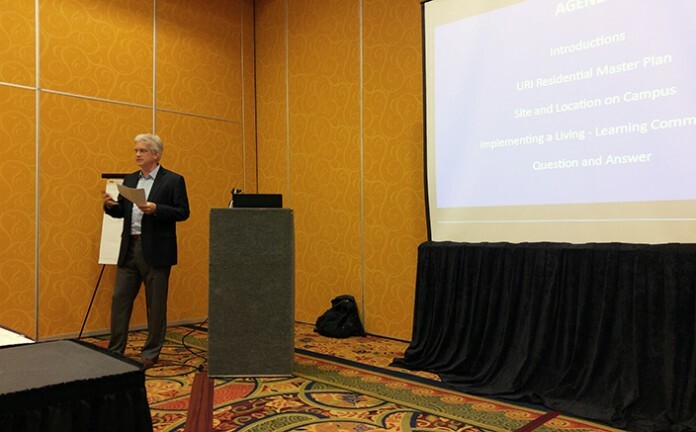 LLB, along with our partners on URI’s Hillside Hall, presented Making Lasting Connections through Strategic Residential Planning: Lessons Learned from the University of Rhode Island’s Hillside Hall at the ACUHO-i Living-Learning Programs Conference last week in St. Pete Beach, Florida. Chris Ladds was joined by Jordan Gatewood from Mackey Mitchell Architects and Chip Yensen, former Assistant Vice President of Student Affairs at URI (currently with the University of North Carolina at Charlotte). Speaking to a full-house of university housing administrators, architects, and other industry professionals, the discussion focused on how the strategic planning of URI’s Hillside Hall served as a model for living-learning communities on campus and how other colleges and universities could learn from the URI model. The team discussed URI’s Residential Master Plan and strategic planning goals, planning and design of the Hillside Hall Complex as it related to site location and orientation and space allocation and layout, and how to develop a similar building program. The session was a great success in exploring the exciting opportunities and complex challenges facing the live/learn community today. Thanks to all that came out to meet our panel and participate in the discussion.